Julie Miller will participate in Ariodante from 02/04/19 through 03/17/19 (Lyric Opera of Chicago). 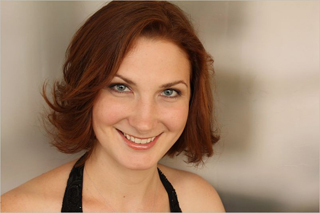 Julie Miller will participate in Rigoletto from 04/04/19 through 04/13/19 (Sacramento Opera). Julie Miller will participate in Mahler's Symphony No. 8 from 05/01/19 through 05/05/19 (Madison Symphony Orchestra). Hailed for her the “arresting color” (Cincinnati Enquirer) of her voice, Julie Miller has appeared as a soloist with orchestras and opera companies throughout the U.S.A. As a member of the Patrick G. and Shirley W. Ryan Opera Center at Lyric Opera of Chicago she appeared on the stage of the Lyric Opera of Chicago as Emilia in Otello, Annina (La Traviata), Ida (Die Fledermaus) and Krystina (The Passenger). Other notable assignments with the company include Baroness Nica in Yardbird plus understudies of Octavian in Der Rosenkavalier and Waltraute in Die Walküre. She recently performed the title role in Handel’s Ariodante which Chicago Classical Review described as an “admirable and professional performance" and the Chicago Tribune called "deeply musical." Elsewhere, she has appeared with appeared with Madison Opera and in London with Hackney Empire as Baroness Nica, Vero Beach Opera as Orlofsky in Die Fledermaus, Sugar Creek Opera as Ma Joad in The Grapes of Wrath, Charlotte in Werther for Opera Idaho and Maddalena in Rigoletto for Sacramento Opera. Other notable roles she has performed include Jo (Little Women), Annio (La clemenza di Tito), St hano (Rom eo et Juliette), Donna Elvira (Don Giovanni), Ottavia (L’incoronazione di Poppea), and the Mother (Amahl and the Night Visitors). She has appeared on the concert stage as soloist Bach’s Magnificat and Cantata No. 6, Handel Messiah, Durufle’s Requiem, Beethoven’s Symphony No. 9, and Mozart’s Mass in C minor and Requiem. Orchestras with whom she has appeared include the Kalamazoo Symphony Orchestra, the Cincinnati Symphony Orchestra, Grant Park Music Festival, Illinois Symphony Orchestra, and was a featured soloist at Carnegie Hall in the world premiere of Ryan Carter's Doot, the Ravinia Festival in Bernstein's Songfest, and with the Oregon Mozart Players, the Elgin Symphony Orchestra as Mezzo-Soprano Soloist in Verdi’s Requiem, and Apollo Symphony for Handel’s Messiah. A regular guest of the Madison Symphony Orchestra, she has appeared with them as Mezzo-Soprano Soloist in Janacek’s Glagolitic Mass and Mahler’s Symphony No. 8, and will return next season for Dvorak’s Requiem. Ms. Miller is the recipient of the the Jerome and Elaine Nerenberg Foundation Scholarship and the Rose McGilvray Grundman Award (American Opera Society of Chicago), the Richard F. Gold Career Grant (Shoshana Foundation) the Edith Newfield Scholarship Award (Musicians Club of Women). She earned her Master’s Degree as a member of the inaugural class of Dawn Upshaw Graduate Program in Vocal Arts at the Bard College Conservatory of Music. She also participated in the Georg Solti Accademia Bel Canto in Castiglione della Pescaia, Tuscany.